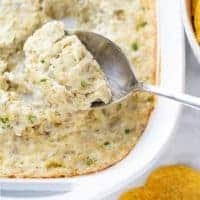 The Best Hot Artichoke Dip! EVERYONE always asks for this recipe! Perfect for any kind of party or gathering. Be sure to use jarred marinated artichoke hearts (and not canned artichoke hearts) for maximum flavor. I also like to use a higher quality grated parmesan cheese (like the kind from Trader Joe’s) so it melts into the dip. Preheat the oven to 350F. Using a stand or hand mixer, cream together the cream cheese, mayonnaise, and sour cream until well combined. Add the remaining ingredients and mix. Spoon the mixture into a 9×9 or 9×13 baking dish. Bake at 350F for 25-30 minutes, until slightly browned and hot/bubbly. Serve immediately with tortilla chips or gluten-free bread. Enjoy!